I finished examining all the items I had stuffed into a shopping bag that were sitting in my parents closet. I showed you some of the things from the 1st half of the bag yesterday, and today is about the 2nd half of the bag. 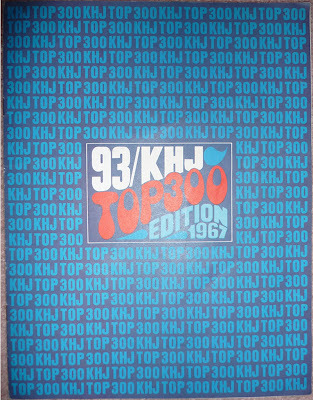 In 1967 KHJ counted down their second annual Top 300 Songs of All Time as voted by their listeners. 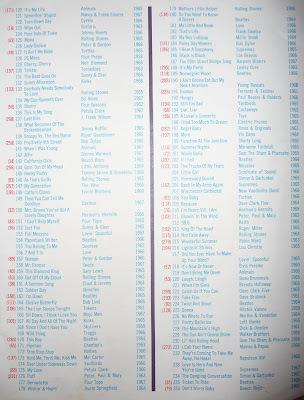 I missed the first one in 1966 because I hadn't yet gone crazy over music. Did you see the Boss Jocks on the last page? 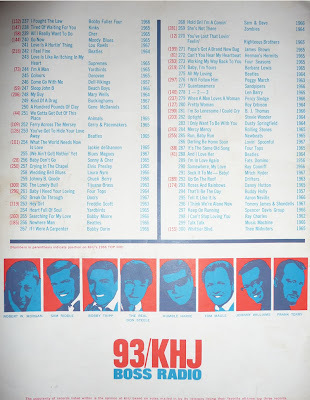 I bet that was one of the hottest, most prestigious jobs you could have in radio at that time - to say you worked in the Los Angeles market as a KHJ Boss Jock. Sam Riddle was my favorite. If I recall correctly, he also hosted a music/dance show on local TV called 9th Street West. My memory is faint but I seem to remember Robert W. Morgan and The Real Don Steele also hosted shows of their own. The latter's show had a regular dance segment when they played Mitch Ryder and the Detroit Wheels' Devil With a Blue Dress and dancers would take the spotlight one by one until they got pushed off the floor by Steele (and pushed pretty hard in some cases, the camera capturing them as they stumbled back into the crowd). A few years later, Humble Harve would be arrested and charged with murdering his wife. That event inspired Rob Karatsu and I to conduct a mock "Free Humble Harve" rally, putting up announcements on the wall in Mr. Soloff's chemistry class calling for supporters to meet in Dorsey's Circle on a specified date and time. Silly, I know, but we had nothing better to do and it was fun doing it. Mr. Soloff was cool, letting us keep it on the wall in his room. 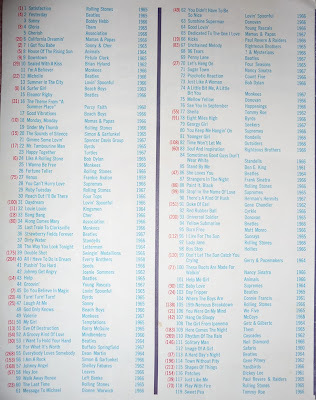 Did you check out the 300 songs? There's some great ones in there that really call up the memories. 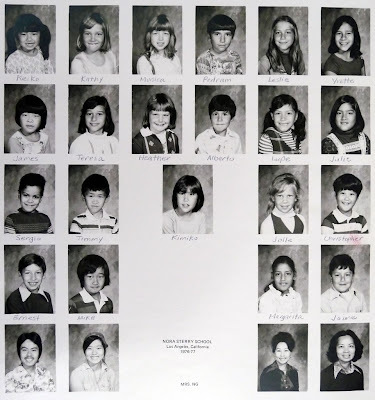 Moving forward ten years, I found a class picture of the 2nd grade class in which I student taught. The school was Nora Sterry Elementary right in the heart of the Sawtelle District, and my master teacher was Mrs. Ng. Check out the picture below, and click on it for a larger view.. I'll let you guess which one is me. I didn't even remember that picture and I laughed when I saw myself. All I needed was to have Jack Albertson next to me instead of Karen (can't remember her last name), the other student teacher in the class.. can you say Chico and the Man? That's Mrs. Ng across the aisle and on her right is the teacher's aide for the room, whose name I forgot. But I remembered most of the students! Before all the trendy eateries and boutiques opened on Sawtelle, when such places were outnumbered by lawn mower shops, it was a Japanese-American enclave and a much quieter community. All the kids told me the place to eat was Ketchies, a hamburger stand so tiny that the owners could barely fit inside of it. Their tacos were pretty good - and unique. They were no Tito's, but tasty in their own way. That just reminded me - do you remember Walt's Cafe in the little green building on Crenshaw? The place where the little old Japanese lady defied the laws of physics, turning out Japanese home cooking to hungry folks at the counter at blurring speeds. That has nothing to do with anything else in this entry but writing about Ketchies made me think about her. 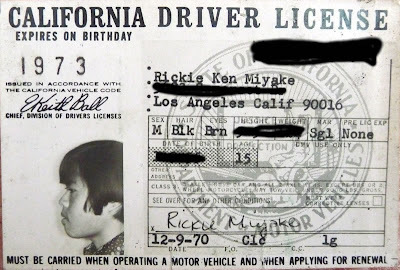 For obvious reasons I crossed out some of the data on the card but while the signature is now different, it was funny to see the weight listed on that license is the same as it is now. The best part of the show - what you just saw, the opening shots and Jose Feliciano singing the theme song. I love the feeling of community that comes across in that brief minute. In the 11th grade I was very dark from playing tennis all the time - like crispy brown. One day Keith Honda brought a newspaper clipping to school that talked about the "Merry Mexican," which he said was me because of my dark color. In front of Kurtis, he then promptly christened me the Merry Mexican, much to my chagrin. After that whenever those two wanted to get my goat, that's what they called me. Haha.. those days..